In 1995 the SDB inaugurated the Edwin Grant Conklin Medal to honor a society member who has performed distinguished and sustained research in developmental biology. The recipient delivers a feature lecture at the annual society meeting and is presented with a commemorative plaque by the incoming SDB President. As years pass and new members are attracted to our society, the following questions often arise: who was Edwin Grant Conklin, what did he do, and why is his name in particular featured in our society award? This essay is intended to answer these questions by presenting a brief description of the man, his work, and his impact on developmental biology. Edwin Grant Conklin (1863-1952) spent most of his career as a distinguished academician and scientist in the Department of Biology at Princeton University. As Chair of Biology for twenty-five years, he organized and guided the development of the department; as a lecturer in introductory biology, he inspired thousands of undergraduates; and he conducted notable research on the embryonic development of marine animals. Conklin's scholarly achievements were recognized by his election to the American Philosophical Society when he was only thirty-four. He was also a member of the National Academy of Sciences, president of several scientific societies, and a member of several foreign learned societies and academies. Conklin was born in Waldo, Ohio and educated in rural schools and at Ohio Wesleyan University. He was raised in a deeply religious background, considered entering the ministry, and was ordained as a lay preacher. However, Conklin's burning interest was in biology, and he decided to enter the graduate school at Johns Hopkins University. Johns Hopkins was an extraordinary place to obtain a graduate education in biology because it was a relatively new school with revolutionary plans to integrate the experimental method into American biology. At that time most American biologists were naturalists or morphologists and used only descriptive methods. However, Wilhelm Roux in Germany, Hans Driesch in Italy, and Laurent Chabry in France had recently applied experimental methods in embryological research. Conklin's graduate advisior, William K. Brooks, was an unadulterated morphologist and highly skeptical of the new experimental approach. However, some of Conklin's fellow graduate students and contemporaries, including Thomas Hunt Morgan, Ross Granville Harrision, and Edmund Beecher Wilson, were enthusiastic about experiments and actively tried to incorporate them into their dissertation research. The efforts of Conklin, Morgan, Harrision, and Wilson were to be the roots of Developmental Biology in America. During the summer of 1890, Conklin was at Woods Hole in search of suitable material for his doctoral dissertation. He chose the marine snail Crepidula and discovered that its eggs divide according to a fixed pattern of spiral cleavage, which enabled him to follow individual cells and their descendants to their final places in the tissues and organs of the larva. He had performed one of the first cell lineage analyses, which were the rage at Woods Hole for the next decade. This experience also launched a lifelong love of the Marine Biological Laboratory at Woods Hole, where Conklin subsequently spent almost every summer. After graduate school, as a faculty member at Northwestern University and at the University of Pennsylvania, Conklin extended his cell lineage studies to the embryos of other animals, including the ascidian Styela. This was to be his most important and indelible work. 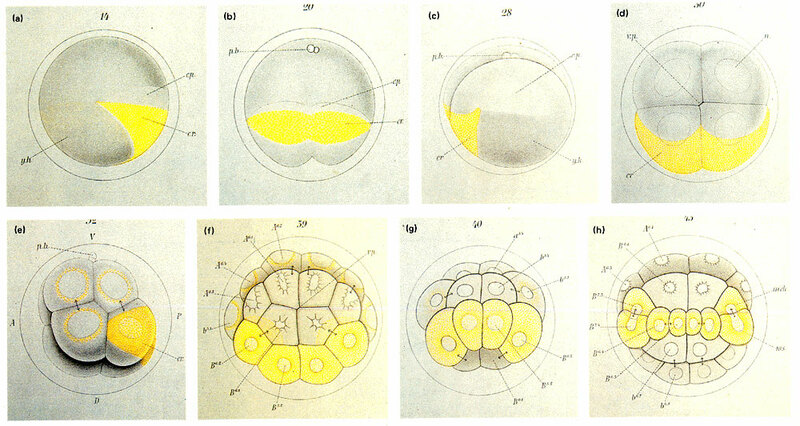 A plate from Conklin’s 1905 classic study on the cytoplasmic organization of the Styela egg. Click on image for larger version. Conklin found that Styela eggs showed different pigments, which were localized in the cytoplasm and after fertilization segregated into the progenitor cells of different larval tissues. The most spectacular of these regions was the yellow crescent, or myoplasm, which was deposited in the tail muscle cells of the tadpole larva. Conklin had discovered a natural cell lineage marker. More importantly, he had demonstrated that the undivided egg, far from being a homogeneous mass of protoplasm, possesses a remarkable degree of cytoplasmic organization. He further refined his investigations through various experimental techniques, such as blastomere isolation, embryo manipulation with salt solutions, and the application of centrifugal force. Conklin proposed a mosaic theory to explain his results, in which cytoplasmic differentiation by determinants plays a major role in early development of the embryo. Edwin Grant Conklin lecturing on the localization of determinants in the Styela egg. He was one of the few developmental biologists featured on the cover of Time Magazine. “The principal problem of evolution is not how modifications are produced in adults, but how they arise in the germ." E. G. Conklin, 1905. Conklin, E. G. (1897). The embryology of Crepidula. A contribution to the cell lineage and early development of some marine gasteropods. J. Morphol. 13, 1. Conklin, E. G. (1905). The organization and cell lineage of the ascidian egg. J. Acad., Nat. Sci. Phila. 13, 1. Conklin, E. G. (1905). Mosaic development in ascidian eggs. J. Exp. Zool. 2, 145. Leitch, A. (1978). A Princeton Companion. Princeton University Press, Princeton, NJ. Maienschein, J. (1986). Defining Biology. Lectures from the 1890s. Chatpter 4. Edwin Grant Conklin. Harvard University Press, Cambridge, MA.